This offense features a tailback-fullback combination in the back field. There is a tight end with a split end and slot back option. This is a very diverse formation and it is a very simple formation to implement. Below are other formation variations. Most youth football plays are sweeps and powers. The power play is the trademark of the I- formation offense. 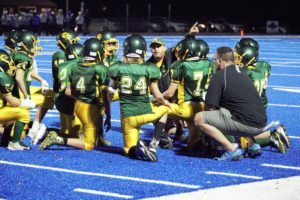 The power play is a simple, but very effective play in youth football. The I formation offense allows the offense to get double teams at the point off attack on power plays. The I- formation offense is very diverse as well. You can run a nice power, counter, trap, sweep and reverse play from this formation. 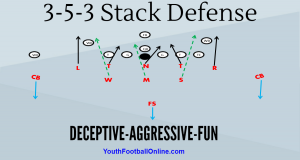 Coaches can utilize any blocking scheme in this formation. You can down block, you can combination block, or use the GOD scheme- pretty much any blocking scheme can be implemented. You can mix up the snap count to slow down the defensive rush. You can use zero line splits or you can even go wide to spread the defense out horizontally. This formation is at it’s best when you utilize a wing-back (WR). Having a wing back creates an extra gap for the defense and creates alignment conflicts for the D. You can have the WB go in motion, changing the strong side of the formation. You can run jet sweep with a wing back. The WB can down block or even double team a tough defensive end. I suggest utilizing a wing back! This power pass play works a corner and a flat route. It is a high-low passing concept. This play works best off of play action. Once the defense starts to sell out trying to stop power, hit them with power pass. All the kids need to carry out their fakes. Another option is to have the left TE do a post. If you see the middle safety flying out of the middle and covering the corner, you can probably hit the let TE on a post. If you have a full back that can catch the football you can have him run into the flat, rather than the HB. The power I- formation offense is just that, powerful! It stacks the backfield with 2 lead blockers. Having the power I backfield will allow you to have the OL double team defensive tackles, nose guards, and or defensive-ends. Pound defenses with this I-Formation Playbook.